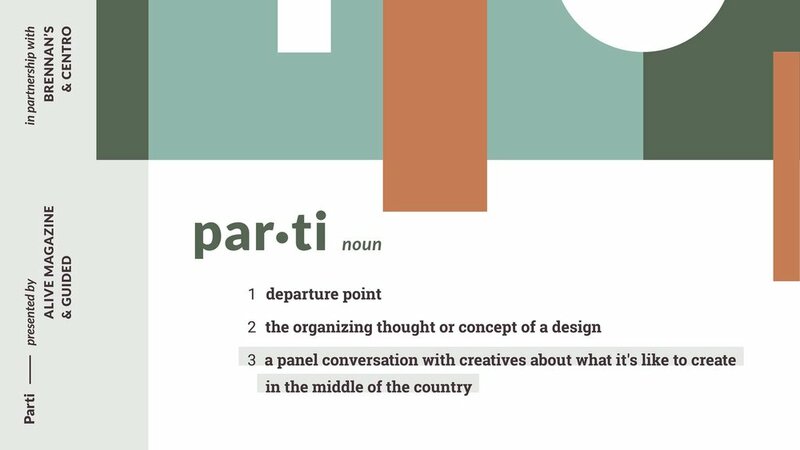 ALIVE Magazine and GUIDEDSaintLouis present PARTI! Join us for a delightful evening of music, mingling, food, drink and conversation at theCentro creative showroom in the CWE. Hear from brilliant retailers, agency creatives, furniture designers, and others about what it's like to build a creative brand in the middle of the country. TASTE delicious small bites from Brennan's and seasonal beverages from Four Hands Brewing. ENJOY music from PRYR. And SHOP the gorgeous goods of Finefolk. HEAR a smart panel conversation with Liz Gardner and Josef Harris of Bodega, Leslie Fraley of Finefolk, Maurice Blanks of Blu Dot and Kevin McCoy of Work/Play. Enjoy food, drink and music throughout the evening.